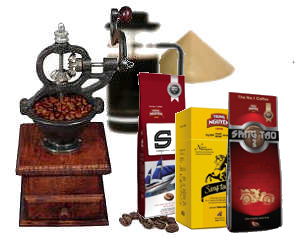 Vietnam has a rich 150-year tradition of coffee cultivation and unique roasting and brewing methods. Coffee cultivation was brought to Vietnam by French Jesuits towards the end of the 19th century in the area around Da Lat, due to its rich soils and 1600m elevation, planting heritage Arabica coffees that still flourish there today. The lower highlands of Vietnam are more suitable for growing Robusta coffees. High quality Robusta peaberries offer a different taste experience and add complexity and the unique dark, 'chocolatey' Vietnamese character to many of the blended coffees. The Trung Nguyên company, one of Vietnam's most successful producers, believes in heritage coffee varieties, sustainable and environmentally responsible production methods and supporting the local community of growers on whom it depends. "[Coffee leads men] to trifle away their time, scald their chops, and spend their Money, all for a little base, black, thick, nasty, bitter, stinking, nauseous Puddle-water."